Features a cute little fire fighter with his adorable dalmatian puppy getting ready to put out the fire! There's a balloon for the age, as well as a red balloon displaying the birthday boy's name. Features: red, black, yellow, fire truck/fire engine, hydrant, dalmatian and fire! 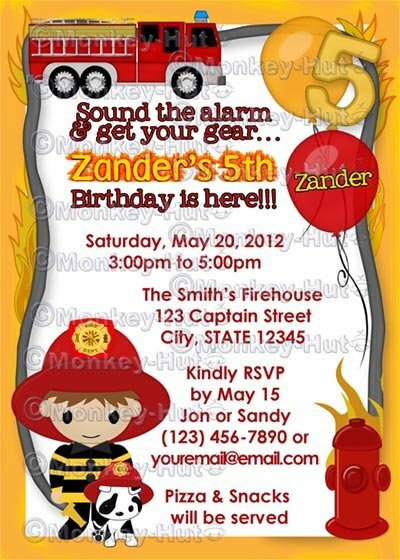 Perfect for a little firefighter's party!! (9) Phone # and/or email (please write out exactly how you’d like (7), (8) and (9) to show – see sample. Do you need PRINTED INVITATIONS instead of a DIGITAL file? The ©Monkey-Hut copyright watermarks across the previews are for image protection and will NOT appear on the actual item you will receive. All artwork, products, and images are ©2000-2012 Connie Girga (aka Monkey-Hut/MonkeyHutDesigns). Artist retains copyright and artwork images are NOT to be reproduced in any way. All rights reserved.